Believe it or not, SIHH 2019 is right around the corner. For those who may not be aware, SIHH stands for “Salon International de la Haute Horlogerie Genève” and it is one of the biggest watch shows of the year. This is the event where brands like Audemars Piguet, Cartier, Panerai, Ulysse Nardin, Jaeger-LeCoultre, Piaget, Vacheron Constantin, and so many others unveil their novelties for the year. As a leadup to the show, some of the brands have released previews to give us a taste of what to expect next year. Let’s take a look at four pre-SIHH 2019 releases. Just last week we discussed the importance of tonneau-shaped watches in Cartier’s history. 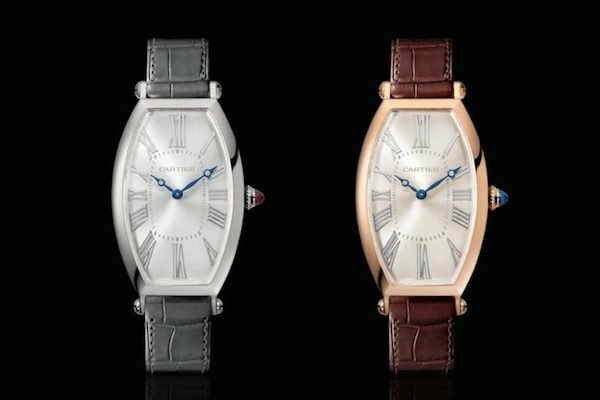 So imagine our delight when the Maison just announced some new models set to join the Cartier Tonneau collection in 2019! The soon-to-be-released Cartier Tonneau Watch Large Model will sport 16mm x 12.9mm barrel-shaped cases available in platinum and pink gold. The pink gold Cartier Tonneau will house a champagne dial while the platinum edition will include a silver dial–and the platinum is limited to just 100 pieces. Naturally, Cartier has fitted these new watches with signature design details from the Roman numerals on the dial to the railroad minute track to the blue cabochon-cut sapphire on the winding crown. Powering the new Cartier Tonneau Watch Large Model is the hand-wound and in-house Caliber 1917 MC with a power reserve of 38 hours. A fantastic offering from Cartier so far. Panerai‘s history with diving is a long one as the official supplier of military dive watches to the Royal Italian Navy in the early part of the 20th century. 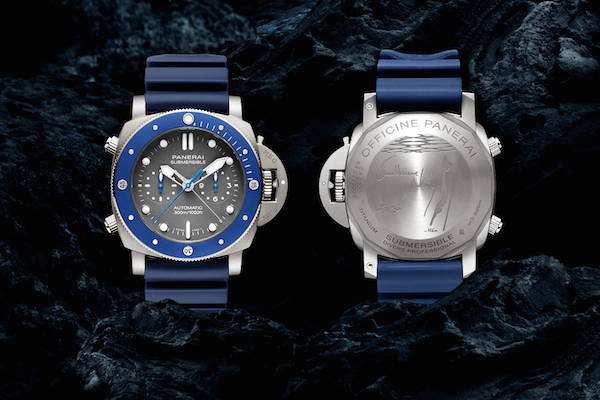 Now, in collaboration with French freediving champion, Guillaume Néry, Panerai announced a new Submersible as their pre-SIHH 2019 release. 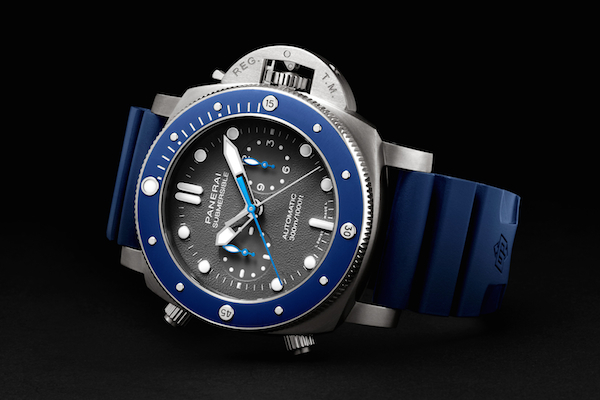 The Panerai Submersible Chrono Guillaume Néry Edition (PAM00982) sports a hefty 47 mm case in brushed titanium topped with a titanium and blue ceramic unidirectional rotating bezel. As a dive watch, the PAM00982 can safely dive down to 300 meters deep while the shark gray dial with luminous hour markers and hands offers plenty of legibility under water. Also, as a flyback chronograph, there’s the duo of subdials on the dial. along with the central chronograph hand. There’s also the matching dark blue accordion rubber strap with a titanium buckle. Running on the in-house P.9100 automatic movement, the pre-SIHH 2019 Panerai Submersible Chrono Guillaume Néry Edition boasts a power reserve of 3 days thanks to two barrels. 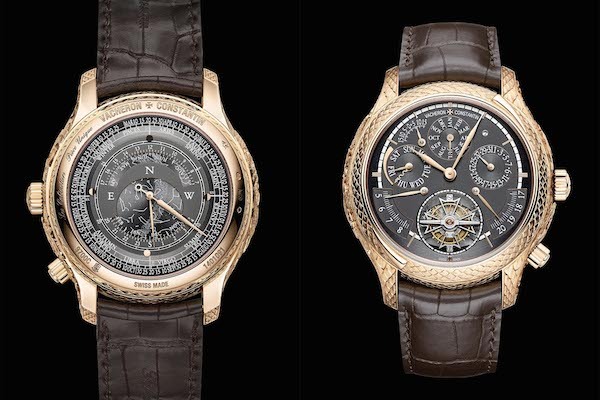 Audemars Piguet made big news earlier this year when they announced that 2019 the last year that they participate in SIHH. So let’s hope they go out with a bang by releasing some fantastic new models. As a pre-game glimpse, Audemars Piguet announced a trio of new Royal Oak Offshore Chronograph “Camouflage” models. Available in blue, green, or brown, the new pre-SIHH 2019 Royal Oak Offshore Chronograph “Camouflage” watches come equipped with 44 mm cases fitted with the signature octogonal bezels, but in matching colored ceramic. The brown version is constructed with a pink gold case while the other two hues include steel cases. The dial includes the familiar “Méga-Tapisserie” pattern, also in either of the three shades, and the rubber camo style straps are where the watches earn their name. However, for those days that you don’t want to wear camouflage, each watch comes with a solid color strap too. At the heart of the new ROO chronographs is the Caliber 3126/3840 automatic movement with 50 hours of power reserve. Withing the already supremely prestigious Vacheron Constantin company is a special department called “Le Cabinotiers,” which is in charge of producing ultra-complicated or bespoke timepieces. Just ahead of SIHH 2019, Vacheron Constantin announced the one-of-a-kind Les Cabinotiers Grande Complication Phoenix model with twin dials, 15 complications, and an intricately hand-engraved pink gold case displaying the mythical Phoenix. The 15 complications include perpetual calendar, equation of time, sunrise and sunset, sky chart, seasons, signs of the zodiac, age and phase of the moon, solstices, sidereal hours and minutes, power, minute repeater, and tourbillon. This dizzying array of functions is all thanks to the famous Caliber 2755 manual-wound movement with a 58-hour power reserve. Given the complexity of this extraordinary example of haute horology, it’s no surprise that Vacheron Constantin only made one piece! The upcoming edition of SIHH will take place from January 14 – 17, 2019 and we look forward to seeing all of the new luxury watches that will be released. Stay tuned for our SIHH reports where we’ll bring you the best that the show has to offer.